26 Strawberry Syrup - for Ice Cream. Take Scarlet & Wood Strawberries - put them into an earthen Pot - a layer of the fruit, & a layer of fine Sugar alternately - Set them in a cool cellar for two or three days - then strain them thro' a muslin bag - but don't squeeze them - Put the Syrup into a jar, and set it in a kettle of water to boil till it is very thick. When cold, bottle it for use - Orange Shrub. 7 Bottles of Brandy - 4 Do. of Rum - 48 Rinds of Seville Oranges - 2 Quarts ( wine-measure) of the juice of Do. 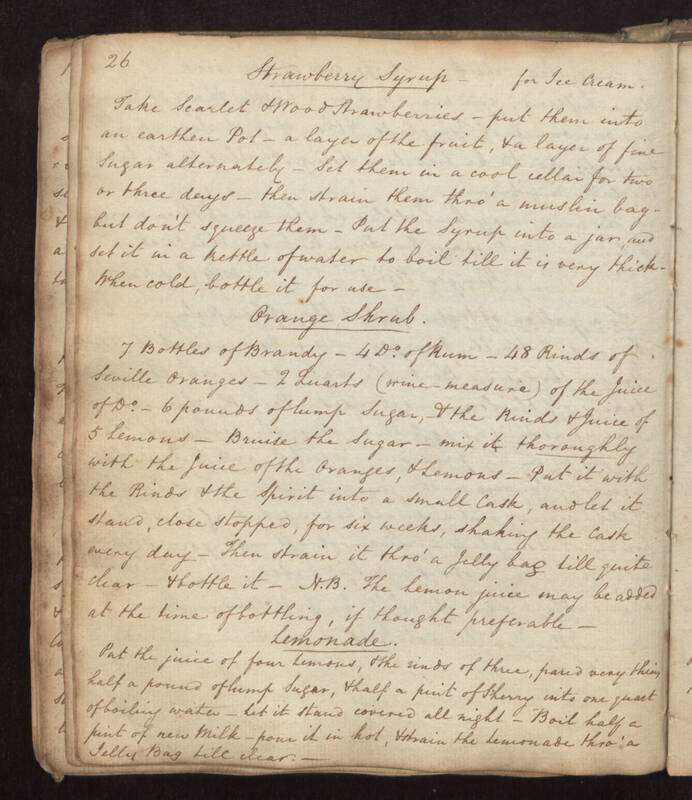 - 6 pounds of lump Sugar, & the Rinds & Juice of 5 lemons - Bruise the Sugar - mix it thoroughly with the juice of the Oranges, & Lemons - Put it with the Rinds & the Spirit into a small Cask, and let it stand, close stopped, for six weeks, shaking the Cask every day - Then strain it thro' a Jelly bag till quite clear - & bottle it - N.B. The lemon juice may be added at the time of bottling, if thought preferable - Lemonade. Put the juice of four Lemons, & the rinds of three, pared very thin, half a pound of lump Sugar, & half a pint of Sherry into one quart of boiling water - Let it stand covered all night - Boil half a pint of new Milk - pour it in hot, & strain the lemonade thro' a Jelly Bag till clear.